So, in the pursuit of grain-free, dairy-free, low-ish carb meals, I have been looking lately at lots of vegetarian and vegan recipes. We aren't giving up meat or fish, or eggs, but I'm finding that starting from a vegan base is giving me lots of ideas for creating interesting meals which tick all my boxes. Then I can modify if I wish, and add whatever I feel we might like in the way of omnivorous eating - or not, as the case might be. Here you see a large dish which is strictly vegan. Avocado chunks bathed in lemon-juice and olive oil. Sticks of carrot and mooli - a type of radish. And a heap of quinoa laced with extra virgin olive oil and finely grated garlic. 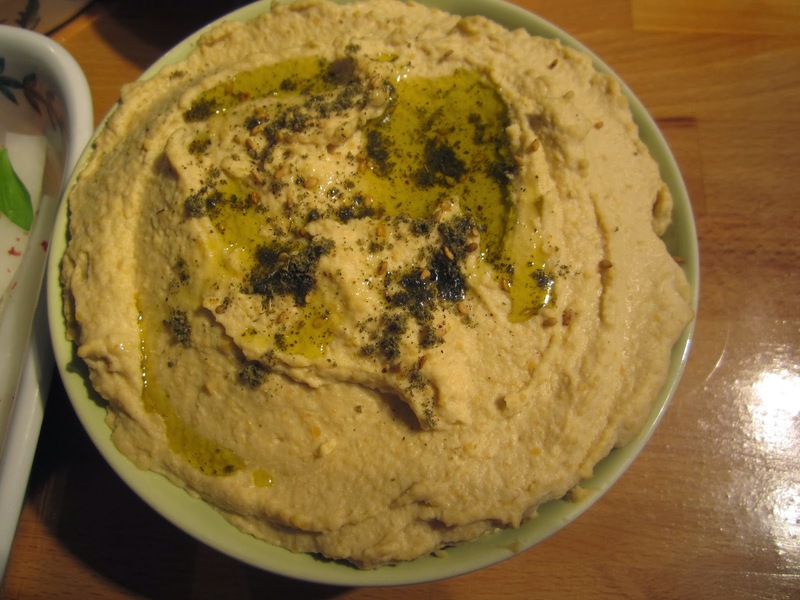 Added to this I made a bowl of hummus, dressed with olive oil and sprinkled with a spice mix called za'atar. Now together with the platter above, this would make a pleasing light lunch. 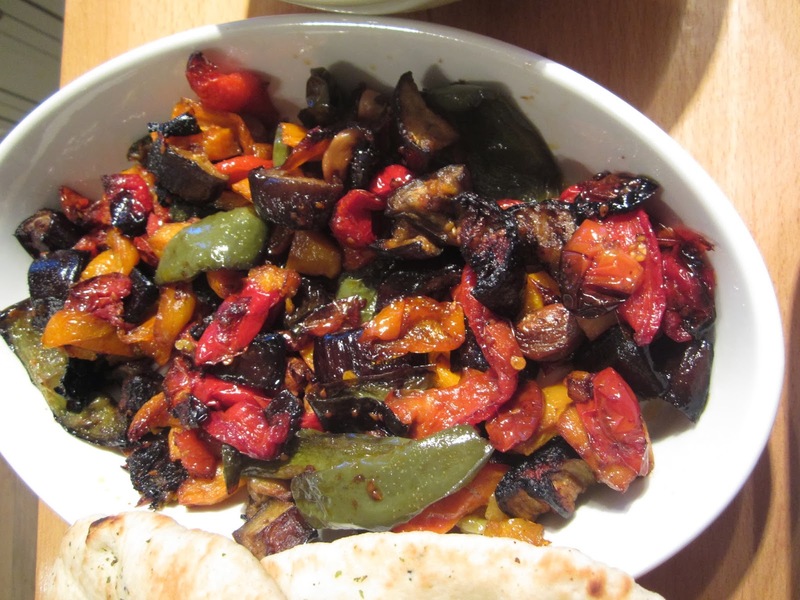 I also added a dish of roasted veggies - butternut squash, red and yellow and green peppers, aubergine, and onions Lots of extra vitamins here, and the meal becomes more substantial. However, it was Saturday night, so we had some finger-licking chicken wings which I marinaded in oil and herbs before roasting along side the veggies. As a special treat I added a naan bread each. So we veered away from vegan/veggie a little, and popped a few grains in with the naan bread, but it made a really interesting and satisfying meal for two, with quite a few left-overs. And before you say that quinoa is a grain - yes, you are right , but it is virtually gluten free, and a great substitute for rice or pasta. Added to which, this is the kind of meal I really enjoy preparing, and it is so easy to double up on the ingredients to feed a few more mouths. I'm wondering whether to include a regular foodie post each month - what do you think? I'm not starting a food blog, but there have been a few foodie posts over the past year and you seem to have enjoyed them. It has become a bit of a habit too, to keep the camera in the kitchen, and Jim often sees a good photo-opportunity before I do! All looks good to me and like you say, another one or two meals can be had from the left-overs. I love to see food on blogs that is a little more out of the ordinary as I think we can all, on occasions, either stick with the same things or be lost for idea's. I think not only is it interesting for other people, it's a wonderful thing to look back on too, however I have to look away when I see dead animals or fish, yuk.... I think burnt roasted veg are the best! Looks like a nice meal. Well done. Hello Andrew - thanks for visiting and your comment. Enjoyed your poetry! This sounds delicious Lynne, most of those things I'd love although I've never tried quinoa. I could happily be meat free most of the time too. I do love a foodie post, more please! I really like the look of your 'nearly' vegan meal Lynne. John and I are trying to cut back on red meat and sometimes have the odd veggie meal too. This would suit our palate very nicely. As you're talking about a foodie post which incidentally is a brilliant idea, would you happen to know how to create a place for it, like a tab on a header for instance? I think I would be able to create the tab or page but not sure how I'd get my subject in it if you know what I mean. I think your meal is a feast, I love Quinoa and have grown it in the past, not sure why I stopped, It has a distinctive nutty taste. 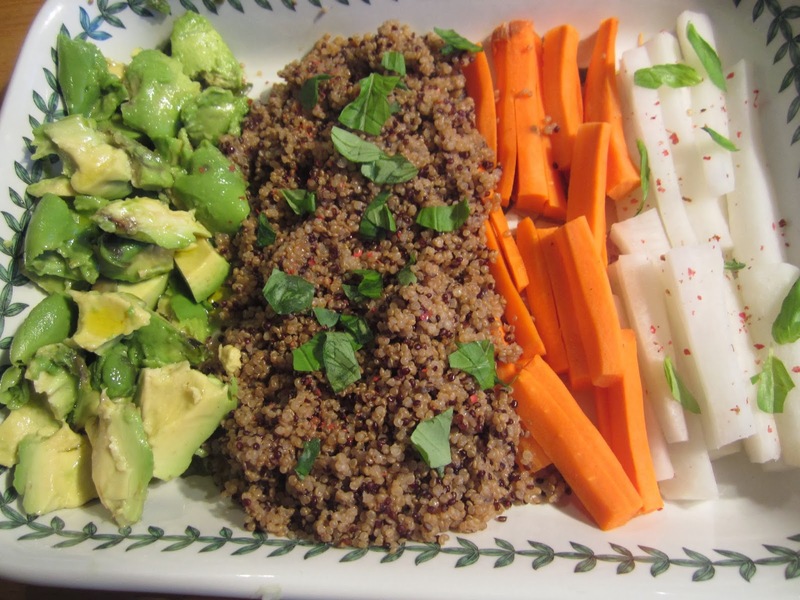 Have you tried Buckwheat, it is a grass seed with no gluten, very nice boiled or steamed and makes wonderful flour. I mix the two and have them hot or cold, they make a good substitute for bulgar wheat in Tabbouleh. Thanks Pam, it was very enjoyable! I've never thought of growing quinoa! I did the Vegetarian Society's foundation diploma - ooh, more years ago than I care to remember, and was introduced to buckwheat and sundry other new-to-me useful grains' seeds. It's really good that people are making more use of them now. just to let you know I'm enjoying the Elly Griffiths books - I'm now onto The Janus Stone and finding it just as hard to put down. There are some concerned faces as teatime approaches and I'm still on the sofa! Aren't they good, Kate? I have her next one all ready to go but that's for my next post. So good to 'pass her on' to other readers. From a feast for the eyes in your previous post to a feast for the stomach here. Yum, looks fabulous. It was, Andrea, and we ate a bit too much, but it did last quite a while so I console myself with that thought! OH NO!!!!!!! Am I too late? I thought it was on throughout March? On the subject of mo meat I'm sure there are meatless meals you have - macaroni cheese? pizza? salads? Yeah, you do! So just incorporate some 'exotic' foods and knock the family for six, I'm sure you''l get away with it!